This is a Clicklaw Wikibook, a collaborative, plain language legal publication that is updated as a wiki and can be printed or downloaded. 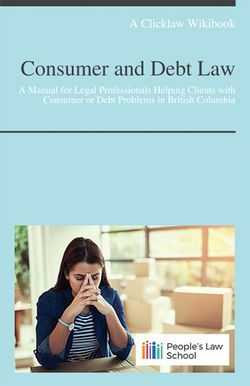 Consumer and Debt Law from People's Law School is a manual for legal advocates and other legal professionals in British Columbia whose clients are having problems with consumer or debt issues. 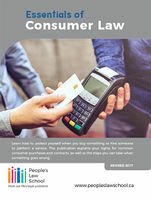 Consumer and Debt Law © People’s Law School is, except for the images, made available under a Creative Commons Attribution-NonCommercial-ShareAlike 4.0 International Licence. The 1996 to 2012 editions of Consumer Law and Credit/Debt Law were published by the Legal Services Society. At People's Law School, we believe accurate, plain English information can help people take action to work out their legal problems. This publication explains in a general way the law that applies in British Columbia, Canada. It is not intended as legal advice. Legal advice applies the law to an individual's specific situation. If you want assurance that any information is appropriate to your specific situation, or recommendations on next steps with a specific legal problem, please contact a legal professional. Some sources of legal help are highlighted in the Agencies that Help section. The 2018 edition of Consumer and Debt Law is dedicated to the late Allan Parker, QC. Allan was a respected lawyer, teacher, mentor and friend to poverty lawyers, paralegals and community advocates. He worked tirelessly to improve access to justice for the disadvantaged. Allan was pivotal in the development and updating of this publication. His many contributions to legal aid and pro bono work in BC will always be appreciated.